Oh, gentle readers, how I've missed the internet! We weren't stranded on a desert island for three days - nay, we were in a gilded, posh hotel. That charged 12 bucks a day for internet. No Wi-Fi. Ethernet cables available from the vending machine for $10. I guess it was worse for him than it was for me, since I was in seminars part of the time. We had a pretty good trip down Thursday. 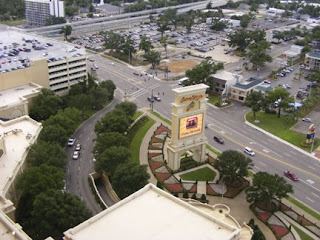 We arrived in Biloxi around 6:30, found the hotel, and checked in. We were all famished by that point, so we decided to grab dinner before unloading the car. Oh.my.goodness. Usher was performing there Thursday night, in a charity show at the pool, and there was a line near the bank of elevators that led to our rooms, snaking around the corner and taking up a good bit of the hallway into the mall. And what those girls weren't wearing would fill a book. I saw a pregnant girl with little-to-nothing on and a MIXED DRINK standing in the line! Did she not remember that it was probably that behavior that got her into that shape in the first place? When we returned from dinner (and a trip through Biloxi where we kept going down dark streets that dead-ended in water) it took us 30 minutes in the parking garage to find a space. Apparently, all the Usher fans thought their $10 ticket entitled them to the same spaces that we paid $300 for. I was soothed to sleep by the sound of the folks in the room next door yelling at each other. Thank God for ear plugs. Saturday morning I had to get myself ready, and Anna Marie. She was leaving for Press Camp at 8:00 a.m. I didn't see her again until 9:00 p.m. She went to two parks, the beach, Chuck E. Cheese's, and the movies, where she saw Kung Fu Panda. 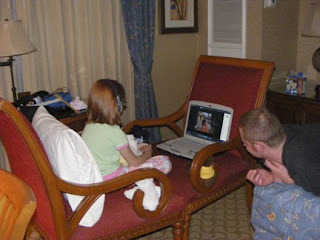 And, as you can see from this photo, was not ready to go to bed when we got to the room, even after all that. We listened to the governor talk for an hour about Medicaid, and get corrected in front of everyone by his wife. We ate lunch next to the pool, and I thought how intimidating it must be to come to work in a two-piece bathing suit every day, like the waitresses did. After lunch, I donned my new suit and lay by the pool for an hour or so. The weather was beautiful, and it was very relaxing. Friday's dinner was divine, as was Saturday's lunch, when we had fillet mignon, rare. I won one award, a third place for best editorial page. I'm a little disappointed, since I won more last year. But my publisher has already informed me that if I don't get a first place next year (and we're notified of the first places ahead of time, so we can get PDFs of the winning entries in for publication) that I'm not going. And Anna Marie has already informed me that I must get a first place next year, so she can return to Press Camp. I'll have to write a whole nother entry about our return trip. And we won't even talk about how my eating went. And when I show a major gain on Thursday, I'm chalking it up to water retention. Yep, denial is no longer a river in Egypt. I only regret that I didn't get to take more pictures, but I was so tired Friday afternoon during our free time that I just lay in the bed and watched television. And that's one of the best part of the trip - the freedom to do nothing for a few hours. Who knew getting three folks ready to go to the beach for three days could be so difficult? I haven't had to pack for a trip with this bunch since Thanksgiving. And this time, we'll have four people in our four-seater car (instead of three) so I have to be extra special careful about using our space wisely. Jason used to have a rule that before we left on a trip, the house had to be clean. I say "used to," because somehow, that rule has flown out the window - maybe one day soon, it'll take the "clean the car out every time you get out of it" rule with it. I really hate that one. Did I mention - both Tom Jones and Usher are performing at the hotel on Thursday night! Not that I have tickets for either, but the potential for random meetings is there, all the same. Well, break time is over - back to packing. I had hoped to have a little more information about the Five Star Races before I posted again. Like, for instance, my time. Unfortunately, I haven't been able to track down the person who has that vital information. Suffice it to say, it wasn't the fastest in the pack, or even the fastest in my age group. Anna Marie had her first half-mile run on Friday night. It was also the first time she was competing with older kids, some as old as nine. It was not the first time she didn't win. Poor baby - she came in DEAD last. I mean, so far behind the rest of the pack that I was starting to get concerned that maybe she'd gotten hurt, and I was about to go searching the course for her. Then, there she came - blazing in her bright green glory. And beside her, on the grass was my mother! She was running alongside, in her sandals and long skirt. The crowd went wild! Shirley from work started yelling for her. And then the announcer guy started yelling for her in the microphone. And then the group of people from a home for folks with mental disabilities started yelling for her! By the time she finally made it to the finish line, there were great gobs of people chanting, "Come on, Anna Marie!" She told me that her legs were hurting, and she was tired, and she almost stopped, but she kept on going! I told her that was the important thing in life: that it didn't matter how pretty, or smart, or talented you were, that if you gave up and didn't finish, you weren't going to do anything in life. Ah, the beauty of a teachable moment. I knew then that, come Hell or high water, I had to get through my two-mile walk. It was SO much cooler this year than last year. And I am about 10 - 15 pounds lighter than last year, but I don't think that was as big a factor as the temperature. I set my iPod to play one of my favorite praise and worship albums, and I set out on my way. On top of the competition on the course, there was also a competition to see which group could have the most members signed up. My Weight Watchers group came in second, with 17 members! I was so proud of everyone - nearly every one of our ladies got a trophy of some sort! After the walk we were all in line at the post-race buffet, and my WW leader was just ahead of me, pointing to the veggie tray and telling us that we DID NOT have to eat that. 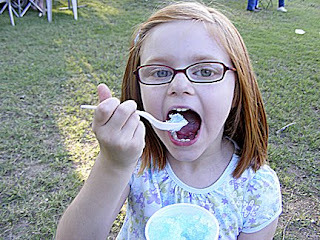 She gave us carte blanche to eat whatever we wanted to - and forbade us to look at her plate, or anyone elses', critically. I don't care that I didn't win. I don't care that I didn't place. All I care about is that I finished, and so did all my WW ladies, and so did Anna Marie. Was I sore on Saturday? You bet your sweet bippy I was. And Sunday too. But I knew I'd earned it, and mentally, I felt like a million bucks. And Anna Marie and I have already gotten together our game plan for training for next year. We'll be ready! Lordy Bagordy, I'm tired, so this will be short. I'll post the full story tomorrow. Did I get a trophy? No. Did a whole bunch of my Weight Watchers buddies? Heck yeah! But I finished, and tonight that is enough. More than enough. And I feel about a bazillion times better than I did after last year's race. Everything I've got hurts, so I bid you all goodnight. Probably not. It's probably like when I was in college, and my dad called me all the time, and my mom told him to stop, because he wasn't giving me a chance to miss him. Or, it could've been because of the enormous long distance bills we were running up. But, whatever. I found my camera! It wasn't in the Jeep after all - I'm ashamed to admit, it was hiding 'neath a pair of capris that were drying on the back of a chair. When I took them off to wear them this morning, voila! Guess I should keep a little cleaner house, huh? 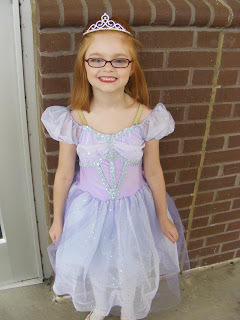 Anywho - here are the long-awaited Anna Marie's Debut as a Dancing Princess pictures. And here is the (partial) video of her tap performance. Not the best quality, since it was taken from the back of the theater with my digital camera, but really, $32.50 for a video of the whole nearly two-hour performance? No offense to the other parents, but I really don't want to sit through two hours of your kid to see 10 minutes of mine. Jolly Holiday from turnermel on Vimeo. I really wish I'd gotten the ballet performance, because it was pretty hilarious. 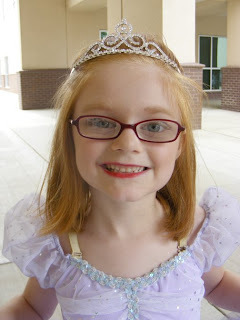 Her tiara kept falling off, and it was a "partner dance" she did with her friend Abbi. Eight girls trying to dance in tandem while dressed as princesses? Hilarity ensues. And I hope you've already gone to Amanda's blog to see the after pictures. I wish I could do with my $300 camera what she does with a $25 one from a thrift store! Well, no, actually, I'm a busy lima bean. I have a few pictures (and a video!) from Saturday's recital, 'tis true. Except, I can't find my camera right at the moment. I think it may be in Jason's Jeep, but we've been like two ships passing in the night for most of this week and I keep forgetting to go out there and look. So, for now, you'll have to visit Amanda's blog. You can see her take on the recital (and a few pics from afterward) here and see a day in the life of Anna Marie's summer job at the auction here. Fear not, bloggy friends - I have not abandoned you. I'll be back to my regular verbose self in a few days! I kinda forgot to do this last night, and I was kinda too tired when I did kinda remember. My child has reverted to her infancy, when she wouldn't go to sleep no matter what we tried. Know what I spend 2-3 hours doing EVERY night now? Trying to get her to stay in bed long enough to fall asleep! I'm going to blame it on our pastor's wife. Two weeks ago in Sunday School, we were talking about parents not having time with each other, who at the same time, let their kids stay up just as late as they do. She admonished us all to put our kids to bed one or two hours before we plan to go to bed, so that we can have time to ourselves or time with our spouse. 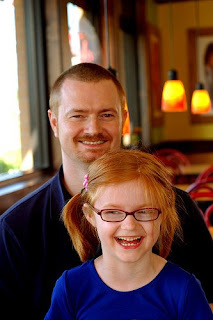 They have an eight-year-old daughter and a teenage son, and she said their daughter goes to bed at 8:00 p.m. every night. And I was on the back row, with a hearty, "Amen!" Because I've been putting Anna Marie to bed at a decent time for years, so that I could get some other things accomplished. Guess what - after that lesson, this kid has given me trouble every single night! I've resorted to waking her up early, instead of letting her sleep as late as she wants. 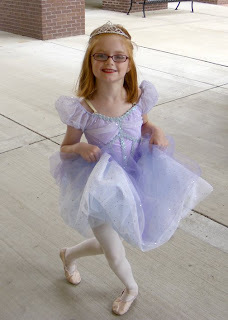 (Which, by the way, didn't work last night, but will be tried again because we have to get up SUPER early tomorrow morning for her dance recital.) I know it's summer, but the better schedule she keeps now, the less trouble we'll have getting back on track in August. Oh, that's right - you want to know what I weigh, don't you? 148. Down a half pound from last week, but still a pound away from my all-time low of 147. But I'm going to get there - never you fear! If I can survive Anna Marie's second infancy. And I'm throwing in this picture, gratis. You're welcome. It was taken at Relay for Life on Friday, and Anna Marie posed for it - as in, she saw me with my camera, and held that exact position, and I said, "Oh, you're waiting for me to take a picture, aren't you?" She is her Aunt Manda's niece. Oh, the hair dryer is fine. Not too big, not too small. And, let me tell you what a ginormous dork I am. (Like you needed me to reiterate that!) Usually, I stand in the (small, not-well-ventilated) bathroom, in front of the mirror, and dry my hair. I dry it most of the way, and then use a big round brush with the dryer to smooth it out and give it "bounce," "volume," and, hopefully, "a semblance of style." Today, I was at home alone (Jason was at the auction, and Anna Marie was with mom) and I was having Golden Girls withdrawals. And they're recorded on the DVR in our bedroom. So I decided to take my dryer in there (where, by the way, there is no mirror) and watch TV while I did my hair. What? You never did that? OF COURSE YOU HAVE. Except, I couldn't figure out how to turn the closed captioning on, so I missed part of the dialogue while the dryer was running! Anyway, because I didn't have the mirror, I just flipped my head upside down, and dried it, and used the brush to give it a little shape as I did. When I was finished, I went into the bathroom (during a commercial break, of course) and flipped my hair back over, and used the brush to smooth it out. Guess what - I've gotten lots of compliments on my hair today. So, apparently, I do better not being able to see what I'm doing. So, I can recommend the dryer. I noticed after I got home that it was also dual-voltage, so if I have need to go to Europe I can take it along! 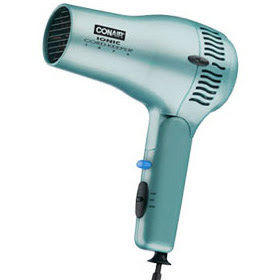 Now, if you'll excuse me, I'm going to mosey back to the Conair site, where I "borrowed" this picture, and enter to win some money by submitting a review. It could happen! So, I didn't make it to Target after church on Wednesday. Did I tell you? My cousin was there at church, and we talked for a bit, so it was a little later than usual when I left. So, I've been using the wee tiny travel dryer (bless it's heart) since mine caught on fire a few days ago. So, this morning, it died too! Not such a dramatic death as its larger, better predecessor, but dead nonetheless. So, today after Anna Marie's rehearsal, and lunch, we went to Target (I'd had an ahem emergency need for a store that sold certain items) and I wandered over to the hair dryer aisle. Know what I love about Target? They have the dryers out, so you can play with them! A few years ago for Christmas I asked for an ionic dryer, and Jason got me one that was like the mother of all hair dryers - five ceramic heaters! The thing weighed a ton! Ergo, holding a dryer before I commit is a big deal for me. Then I saw the folding dryers and thought, gee, it'd be nice to have one of those when I travel, or for storage in general. But there wasn't one that was ionic, and a cord keeper, and a folder. I was about to give up (and in the middle of a cramp) when I saw one in the wrong spot on the shelf. It was the only one, but it was ionic, and a cord keeper, and a folder! I was about to walk to the scanner to see how much it was, when Jason came from the endcap with - wait for it - the same exact one! Wait - it gets better - it was priced a full $5 less than the other ones I'd looked at! Score! I can't wait to use my new dryer tomorrow - it was meant to be, so I bet it'll give me the best styling experience ever! Or at least, just dry my hair - I guess that will be enough for now. Or, Friday Frightening, however you'd like to look at it. The girl in the white is from France. She's in PR and marketing, and she's here on an exchange with the Rotary club, so she came and spent the morning with us. Poor thing - she has a five-year-old son she's been away from for a month while she's been in the US! Now, I can look back at this post whenever I get discouraged, or maybe just when I get tempted to eat a Reese's. Remember last week when I gulp gained two pounds? Well, this week I lost a half of one of those. I'm at 148.5 this week. I have, however been streaking. Mel at The Diet Naked Blog is challenging everyone to exercise every day during the month of June. And I read her post on Monday, and I just happened to have exercised Sunday, so I did some Monday and was all caught up! And now it's June 5, and that's five days in a row! This morning, I didn't feel like exercising, but I thought, "I'm on a streak! I've got to keep going!" A hair dryer that catches on fire when you turn it on, that's what. I had to resort to the wee tiny travel dryer, and up next to my super-charged ionic model, it was hardly a match. Guess I'll be stopping in at Target tonight after church to spy out new models. 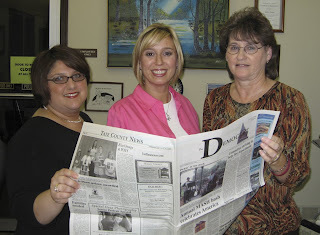 In other, more interesting news, read about Anna Marie's latest adventures with her Aunt Manda here. Everyone needs an Aunt Manda! I made myself exercise tonight! Outside! In the heat! I just did it because I told you I needed to, you know. Accountability rocks! I hate to post this and run, but I'm watching Ocean's Twelve and they're just in a commercial break. Is it wrong to say movies like this make me want to be a master thief? We have a two-mile walk coming up in our town in about three weeks. I've entered the walk the past two years. The first year, I got a trophy! Third place in my age range! Last year, I got big fat nothing, because I got heat exhaustion and had to quit. My wonderful WW leader, who also participates, suggested that I walk outside when the weather got warmer (as opposed to inside, where it's nice and cool and I have a TV!) so my body could get used to the temperature gradually. And it dawned on me this morning that I hadn't been training like that! And the event is less than three weeks away! Since it's already climbing into the 90's here in the Deep South, early morning would be the ideal time. But I do nothing in an ideal way, so I didn't go walking before work. And I thought about doing it at lunch, but then I went to the restroom and saw my reflection. And I thought: man, I am FINALLY having a good hair day. No way am I messing that up to go walking and get all hot and sweaty, and then have to come right back to work! Guess I'll just have to find time, at least today, to go out after supper. Because good hair days aren't easy to come by, and I sure as heck am not wasting one! This post brought to you by the letters G, O, and D.
And also lots of coffee, because I've been up since 4 a.m. Happy Monday to me! So, the ever-challenging Heather has been brave enough to share her personal testimony over the past week, and now is challenging her readers to do likewise. And, as one of her readers, I guess that means me. Yikes! It isn't that I'm ashamed of God, or His place in my life. It's just I haven't thought that my testimony was "exciting" enough. Really, I've been in church since before I was born. My grandfather, several aunts, and mother are all ministers. I spent my childhood traveling all over the country, in one beaten-up vehicle after another, so my mom could fulfill her call as a "singing evangelist." Then what do I grow up and do? Attend a Christian college, and marry an ordained minister. I can't get away from this God stuff, even if I wanted. But you know what I've learned in the past few months, especially? That just because I got saved at the age of five, sitting in the floor of my bedroom, with my mother and her object lesson involving construction paper hearts, doesn't mean I can't learn a thing or three from God. My family, y'all, is pretty messed up. There are some folks right now, that are seriously acting a fool. I mean, seriously. They are taking an already not-ideal situation, and "stirring the pot" to make it more than it has to be. They can't deal with their own business, so they feel compelled to get into someone else's and see what they can do to make it more exciting - at least for themselves. They apparently don't care about what happens to those they leave in their wake when they move on to their next drama. They're destroying themselves, and they don't even realize it. I'll admit, it can be somewhat "fun" to sit around when a crisis is ongoing and go over and over it. I know, because I spent the entirety of my summer last year doing just that. In a morbid sort of way, it satisfies some need within us as humans. But it doesn't profit us one whit. It's like our pastor said yesterday in Sunday School, some folks can't stand the quiet because it would cause them to stop and think about where their lives are now and where they are headed. And that's the predicament that a segment of my family is in right now. There are folks in my family who operate solely out of fear, out of a need for affirmation, or out of a need for self-preservation. And really, aren't those all just about the same thing? And if it wasn't for God, I'd be in the same boat they are. As we were singing one of the songs during worship yesterday, a thought hit me. The lyrics talked about wandering aimlessly in the dark, before God led us into the light. Most of the time, people use that terminology to describe a life of sin and disobedience. You know what hit me? My darkness might not have been what most folks term "sin" - I've never used drugs, never been drunk, and I was a virgin when I got married. My darkness is this legacy that my family has created. My darkness would be following in the footsteps of some of my relatives, even those who claim to know the Truth, and choosing to live in fear and selfishness. Self-preservation as a motivation is a natural instinct, but it denies God the chance to provide for us. Fear isn't in His will for us either - He wants us to live free from fear, dependent upon Him. Fear can't live in an atmosphere like that. So that's where God met me this time. I wasn't out in the bars, or cheating on my husband, or even on my taxes. I was fighting against those things which some members of my family have chosen over The Way, The Truth, and The Life. With God's help, I have chosen the "more excellent way" that Paul speaks of. I have chosen light over darkness. I have chosen to rely on God, and not my own schemes and manipulations, to help me make it through. And I have chosen to embrace the silence, and to let it force me to introspection and prayer, rather than creating a constant drama so that my soul's cry is drowned out by the noise. These are conscious choices that I have to make every day. 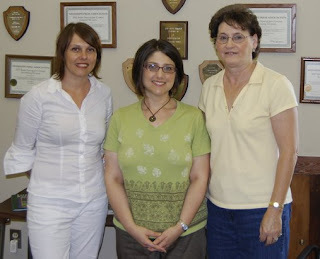 Heather's challenge is to testify as to how God meets us where we are. We aren't always in the same place, but right now, right here is where I am. He's so good, He knows exactly where we are and how to get there. She's even adding an incentive, in the form of surprises, because she knows that it sometimes takes a bribe to get us to do the right thing. And now, I repeat that challenge to you: where has God met you? You don't have to have a "Damascus Road" conversion experience (although there's certainly nothing wrong with God meeting you there) but start to think about the more subtle ways that He meets you at the point of your need. Then share them with us! I don't know about y'all, but I need all the encouragement and strength I can get!